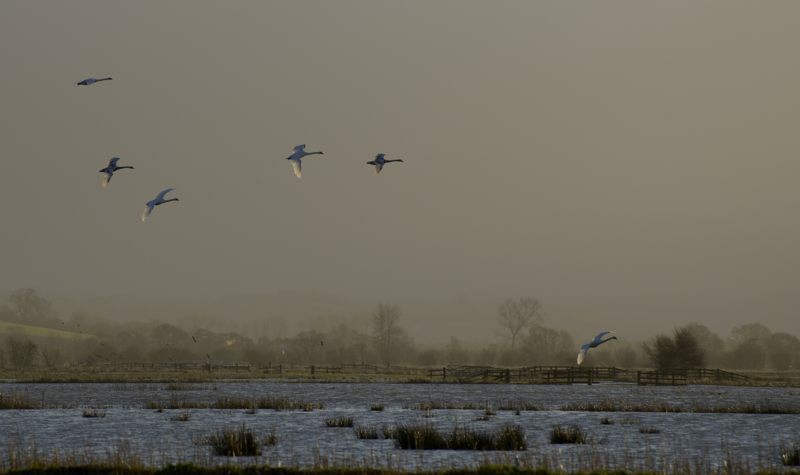 Mute Swans about to land on flooded Tealham Moor, south of Wedmore, on the Somerset Levels; 7 Feb 2014. Much against good sense, I ventured down onto the Levels recently, to my habitual haunts on Tealham and Tadham Moors. Not daring to take my usual cross-country route because of the many places where even small amounts of flooding might cut it, I drove down the main A38 road south from Bristol to Highbridge, and then went eastwards into the flatlands along another, relatively large road. All was well on these main roads, but as soon as I got onto the smaller lanes, problems with water appeared. Tealham and Tadham were mostly submerged, with just just the roads sticking up above the waters and little traffic about, but the floods in this more northerly part of the Levels are nothing like those further south, south of the Polden Hills, where whole villages are being overwhelmed, main roads have been cut for weeks, cutting edge pumping technology has been brought in from Holland, and the Army has been called in to help the local people. The image is starting to look rather unphotographic, more like a painting maybe, and I always feel good when this happens. Something of a milestone, I suppose, my 300th post from these lush, wet (often very wet!!!) flatlands. What can I say? I love the place. I love the very basic, what-you-see-is-what-you-get simplicity of the place. There is no advertising hype here, no marketing, no tourism, just a flat landscape, the local farmers, the occasional person walking their dog, the occasional person simply walking, the occasional birdwatcher or photographer, and that’s it. Many years ago, I recall going into the single shop in Westhay (which has long since closed down) and saying to the shopkeeper “There aren’t many people about this morning”, to which I received the somewhat mournful response “There are never many people about round here”. Bring it on! The place is not of course immune from the noise of motor vehicles, but sometimes there are just the sounds of the wind, the birds, the cows, and the soft lapping of water. 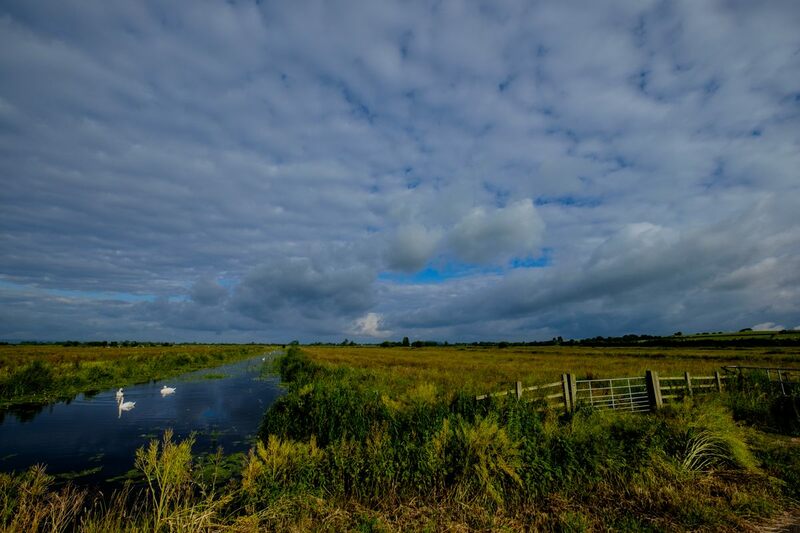 And here on Tealham Moor, and on the nearby Tadham Moor too, great big open skies which powerfully remind me of the vast open skies above Africa – actually, more specifically, the skies above Kenya. For me, there are far too many people in England, but that’s not the problem it might be because in the main, and especially so away from tourist areas, most people stay relatively close to their cars. So, what is pictured here? Well, flat land, land at or just below sea level, that was underwater in the geologically extremely recent past – I’m talking of only a few hundred years ago – and which will be underwater again in due course, when the coastal defences along the nearby Bristol Channel can no longer totally hold back the sea. In Roman times, seagoing boats regularly crossed this area, inland to Glastonbury. As we look at this view, there is slightly higher ground up on the right. Not long ago, that was an island. And the dead straight waterway disappearing off towards the horizon on the left is the North Drain – a totally man-made channel vital to the drainage of the area. The large white birds are Mute Swans, a species whose wings make a beautiful, rhythmic singing sound in flight – birds which I recently portrayed at far closer quarters here and here. And finally, not far beyond the horizon, along the muddy shores of the Bristol Channel, well, that’s where I come from. If I have one, that’s my homeland. Click onto the image to open a larger version in a separate window, and click onto that image to open it still further – recommended. Technique: X-T1 with 10-24 Fujinon lens at 15mm (equiv); 400 ISO; Lightroom, using the Astia/Soft film simulation; Tealham Moor, south of Wedmore; 24 June 2016. 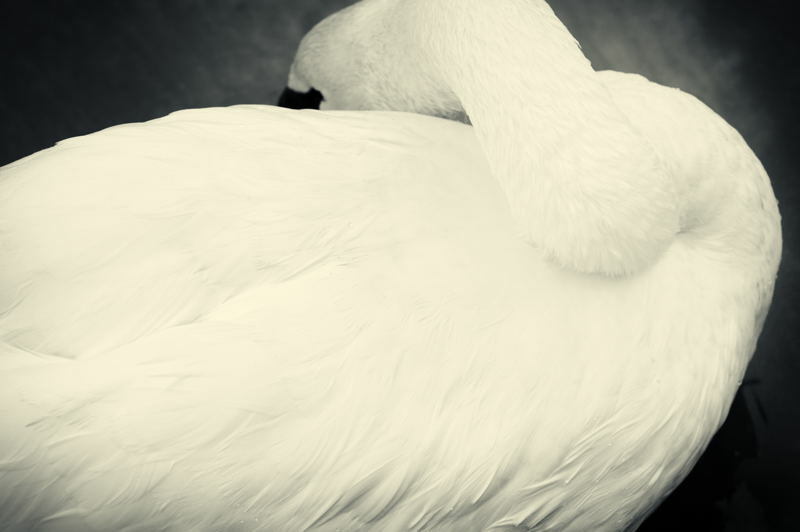 Mute Swan reaching back behind its wing to get at an itch or readjust its feathers. This shot was taken moments before that shown in the black and white Still Life 102 post. Click onto this image to open a larger version in a separate window, and click onto that image to enlarge it yet again – highly recommended. Technique: X-T2 with 55-200 Fujinon lens at 305mm (equiv); 200 ISO; Lightroom; Herriots Bridge, Chew Valley Lake, Somerset; 3 Apr 2017. Mute Swans in the water-filled ditch – the rhyne (rhymes with seen) – that runs along beside the mostly single track road across Allerton Moor. A misty morning. 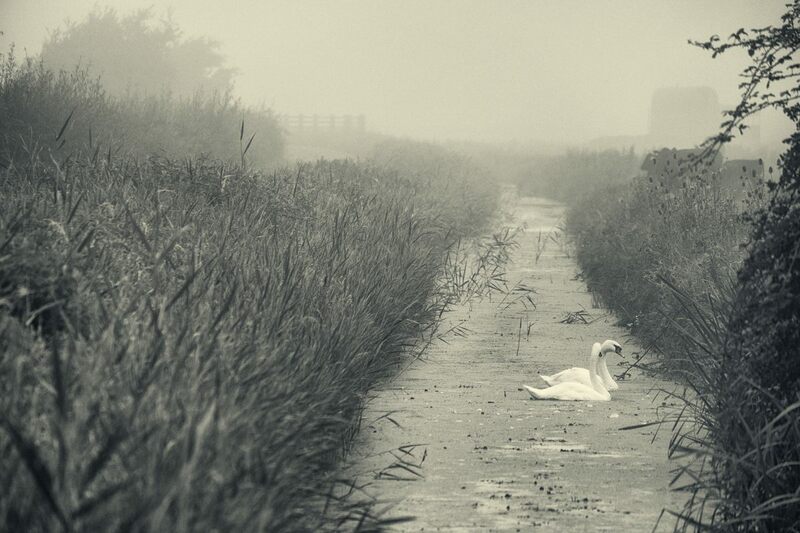 The rhyne, which does duty as the field’s fence in this wet part of the world, runs on off into the distance before starting to bear off to the left, where a faintly seen fence beside the road keeps the unwary traveller from the deep and glutinous clutches of the dark water and ooze. Up right of the swans, cattle at the rhyne’s edge: there may be a place there where they can get down safely to the water’s edge to drink. And behind the cattle, in the murk, farm buildings. Technique: X-T2 with 55-200 Fujinon lens at 305mm (equiv); 400 ISO; Lightroom, using the Provia/Standard film preset; Silver Efex Pro 2, starting at Janice’s Infrared preset; Allerton Moor, west of Chapel Allerton; 22 Aug 2017. Mute Swan preening in the harbour at Mevagissey, Cornwall; 24 Oct 2012. Two of these beautiful waterbirds appear very much at home in this harbour – no doubt vastly encouraged by the people who regularly feed them! Having been fed, this pair hung around right below the quay, and I was able to look right down on top of them. This is a Minimalist shot. There are comparitavely few tones, and the shapes are dominated by the huge, oval mass of the bird’s body, with the neck writhing snake-like back over the closed wing, trying to reach somewhere awkward. 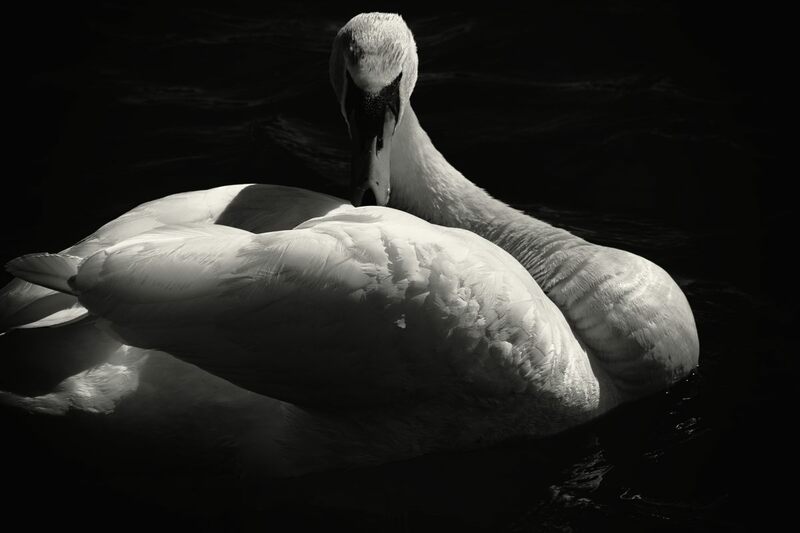 My gaze was attracted to the contrast in shape between the bird as a whole and this sinuous neck. The bird’s face is hardly seen – just the dark skin around the eyes and the base of the bill – but this is sufficient to give some focus to the shot – and the eye following the sinuous neck back arrives at this small area of black. I’ve cropped the shot quite closely, so that the bird appears so large that it seems to be bursting out of the frame. But keeping the dark backdrop up against the right vertical of the frame, and so preserving that soft and beautifully curving breast, was totally mandatory! Technique: D700 with 70-300 Nikkor lens at 300mm; 800 ISO; converted to mono in Silver Efex Pro 2, using the Darken Contrast Vignette as a jumping off point. UPDATE: very much a long-term favourite of mine, for the reasons given above. The simplicity of this image is really the thing; Minimalism; less is more. Looking at it again this morning, my eye is also drawn to those half-seen little bits of plumage detail along the bird’s flank, along the image’s bottom margin. This image is best viewed enlarged – click onto it to see a larger version in a separate window. 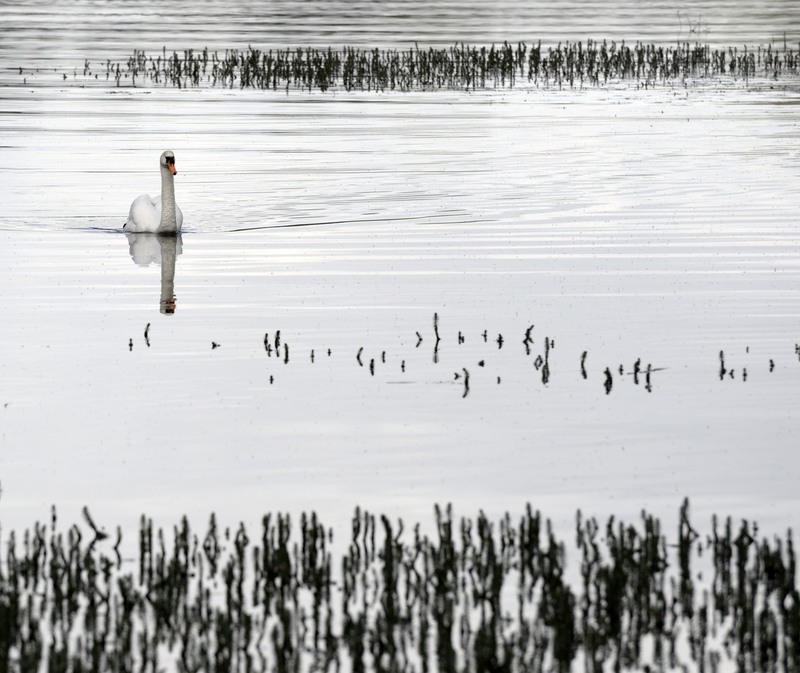 Mute Swan in the bay beside Brook Copse, on Chew Valley Lake’s northeast edge; south of Bristol; 15 May 2015. An image almost without colour, with the marked exception of that beacon-like bill. 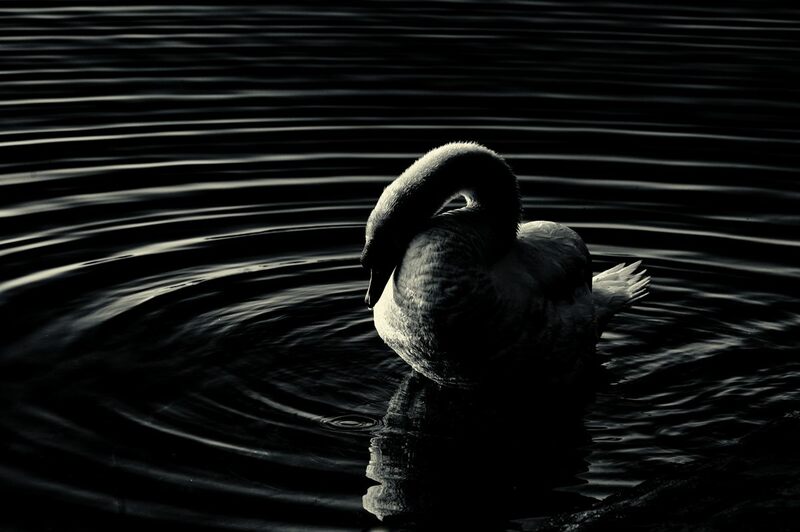 The various structures within this image are mainly horizontal – the wavelets, the areas of water plants – but the bird’s gentle bow wave is at a slight angle to this trend. A popular path around the lake crosses a small stream or brook here via a small bridge, and walkers often feed the waterbirds from the bridge. This swan spotted me on the bridge from some way off and, ever ready for food, came over – but I had not a thing edible on me! 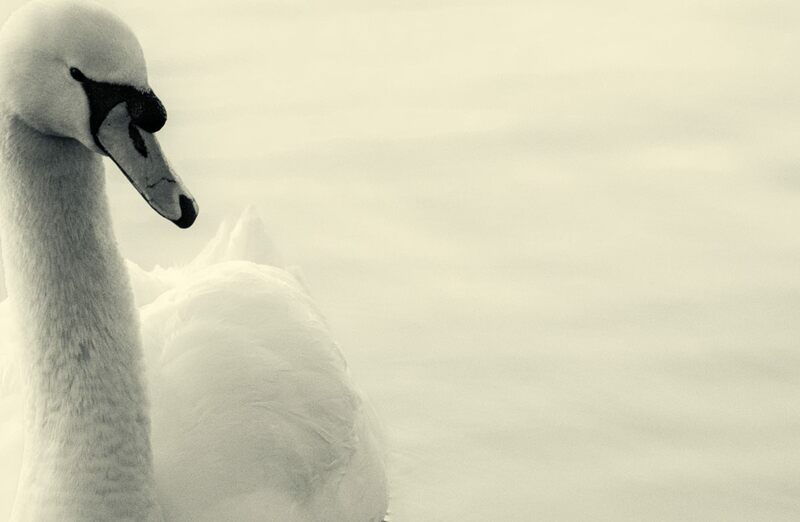 You can find a very different picture of a swan at this lake here. Technique: D700 with 70-300 Nikkor lens at 300mm; 400 ISO. UPDATE: I still very much like the simplicity of this, both in terms of colour and the textures and structures present. The structures are of three types. Those on the water’s surface are linear. Then there are the three horizontal bands of blackish emergent vegetation – out of focus in the foreground, highly scattered in the middle ground, and helping to form some sort of more solid closure to the top of the composition. And the swan, really, is the only more rounded, organic thing there. 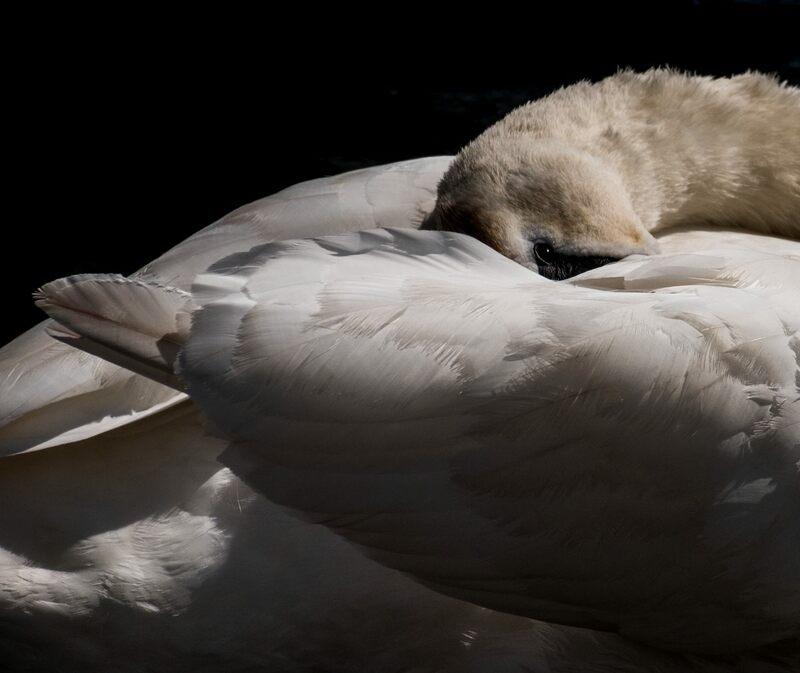 Mute Swan in low key – the first of these bird still lifes, with context, is here: 1, and there are other images here: 2; 3. Click onto this image to open a larger version in a separate window, and click onto that larger image to enlarge it yet again. Technique: X-T2 with 55-200 Fujinon lens at 305mm (equiv); 200 ISO; Lightroom; Silver Efex Pro 2, starting at the Full Dynamic Smooth preset; Herriots Bridge, Chew Valley Lake, Somerset; 3 Apr 2017. 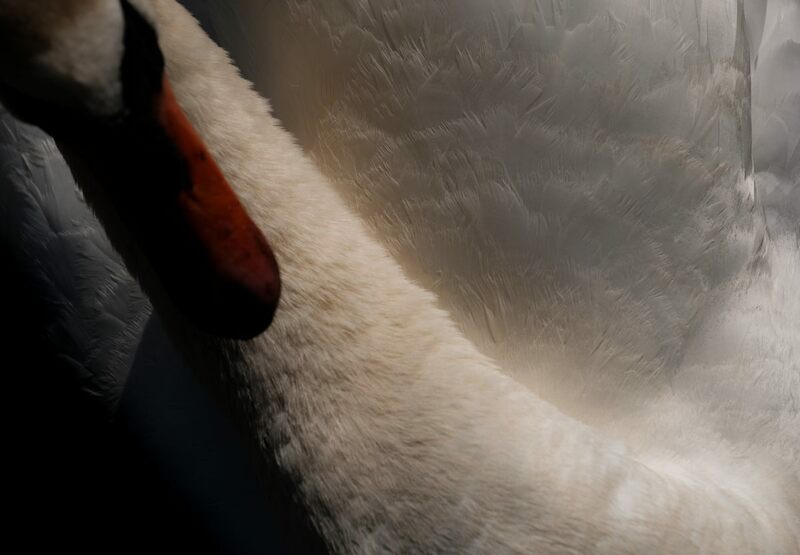 Close in with a Mute Swan – the first of these bird still lifes, with context, is here: 1, and there is another image here: 2. Technique: X-T2 with 55-200 Fujinon lens at 215mm (equiv); 200 ISO; Lightroom, using the Classic Chrome film simulation; Herriots Bridge, Chew Valley Lake, Somerset; 3 Apr 2017.